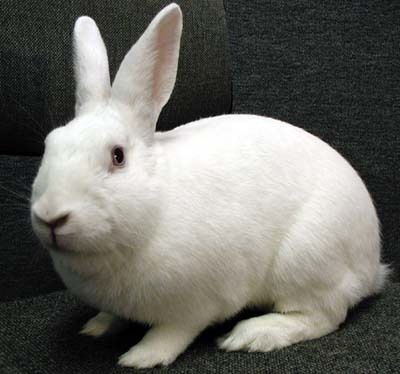 A House Rabbit Society volunteer rushed Cleo to the Bay Area VCA on 4/17 because she hadn't eaten overnight. It turned out she had a twisted (torsed) liver lobe. She was bleeding into her abdomen and her red cell count was 1/3 of normal. She was rushed to surgery and a sanctuary bunny, Tobe, was brought in as a blood donor. Sadly, Cleo died just before we could transfuse and start surgery. Dr. Carolynn Harvey did a post mortem exam and confirmed the diagnosis. Liver lobe torsion has no known cause or predisposing condition. It's uncommon and usually fatal. Cleo was a very special bunny and she will be missed by all of us at SaveABunny and the House Rabbit Society Foster Center.